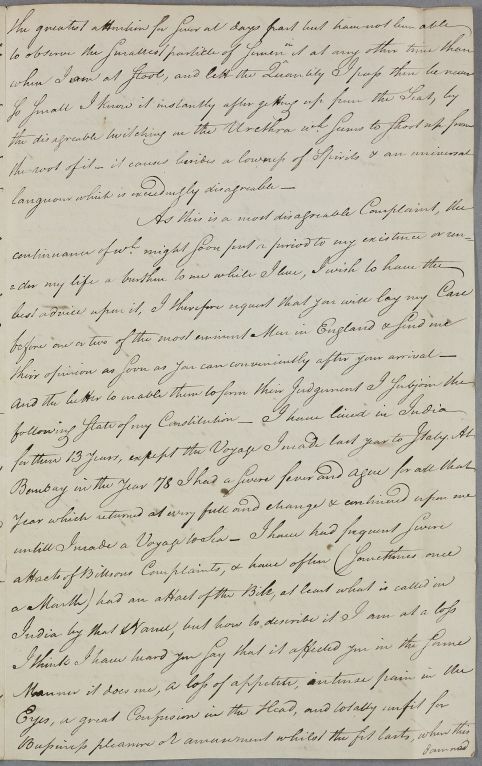 Unsigned letter from Andrew Reid, giving his own case history, probably to his friend John Carmichael, whom he asks to 'lay my Case before one or two of the most eminent in Men in England & send me their opinion as soon as you can conveniently after arrival'. 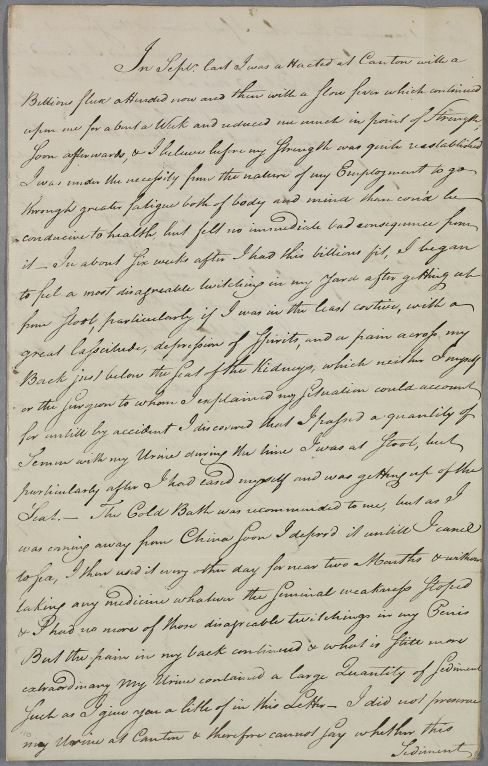 This is probably the account Carmichael presented to Cullen, to which Doc [ID:177] is the response. Reid became ill in Canton the previous September, with bilious and genito-urinary complaints. He has suffered from the clap. He has lived in India for thirteen years, and travelled to Italy last year. He encloses a sample of sediment from his urine for examination. 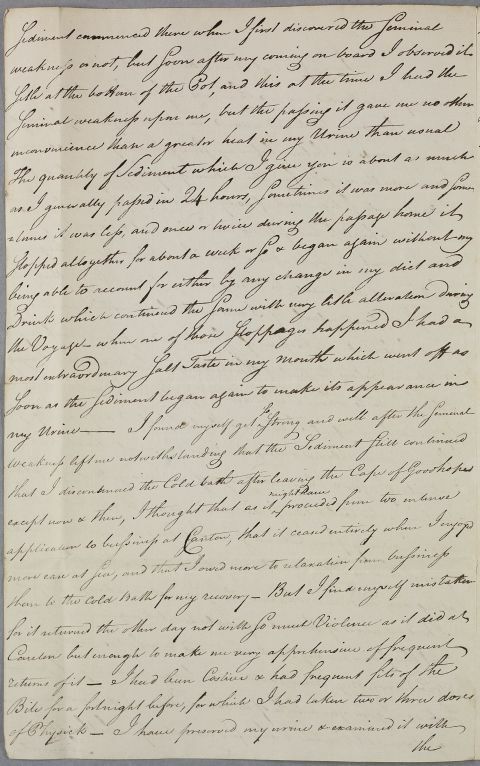 Summary Unsigned letter from Andrew Reid, giving his own case history, probably to his friend John Carmichael, whom he asks to 'lay my Case before one or two of the most eminent in Men in England & send me their opinion as soon as you can conveniently after arrival'. 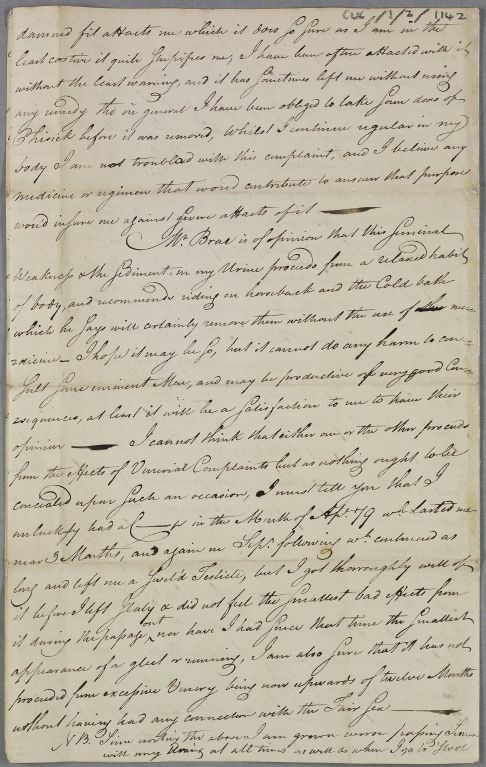 This is probably the account Carmichael presented to Cullen, to which Doc [ID:177] is the response. Reid became ill in Canton the previous September, with bilious and genito-urinary complaints. He has suffered from the clap. He has lived in India for thirteen years, and travelled to Italy last year. He encloses a sample of sediment from his urine for examination. Case of Andrew Reid in Antwerp who has is passing some unidentified substance in his urine which indicate a bladder disorder. He sends Cullen a sample of the 'powder' he is passing. upon me for about a Week and reduced me much in point of Strength.